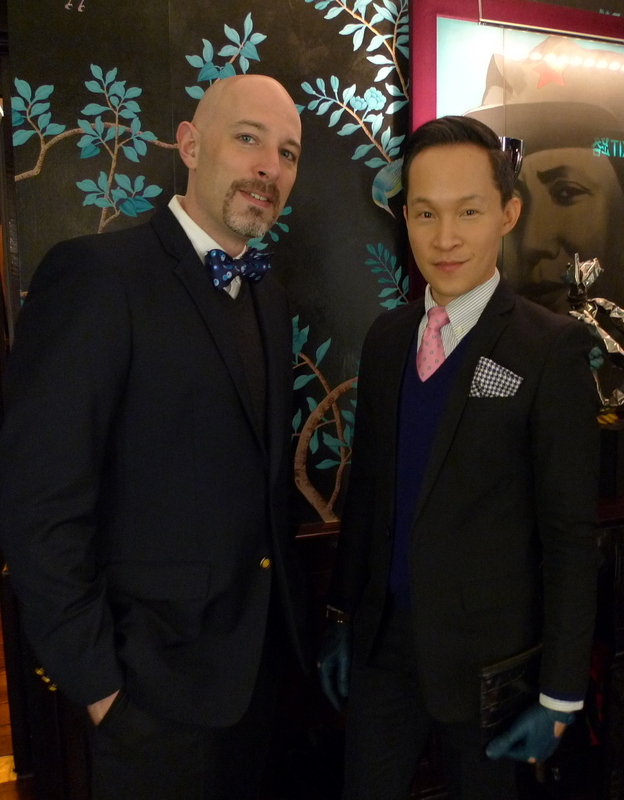 New Year’s Eve was spent at the China Club, a retro-chic private club in Hong Kong, for music from the early 1900s, atmosphere from all over the place, and food that was mostly Cantonese. Tawn and I dressed to the nines. We didn’t realize that the theme for the night was for Great Gastby-ish dress, otherwise we would have worn some vintage crushed velvet dinner jackets. I’m proud that I achieved one of my 2013 resolutions: being able to tie my own bow tie without watching the YouTube video to guide me. Success! The interior of the club, which occupies the top three floors of the old Bank of China building, has the feel of a Chinese tea house but with loads of contemporary art on the walls. It was a happening place with lots of young professionals crowding the tables. Someone needs to remind these young men that gentlemen do not remove their jackets at the dinner table. 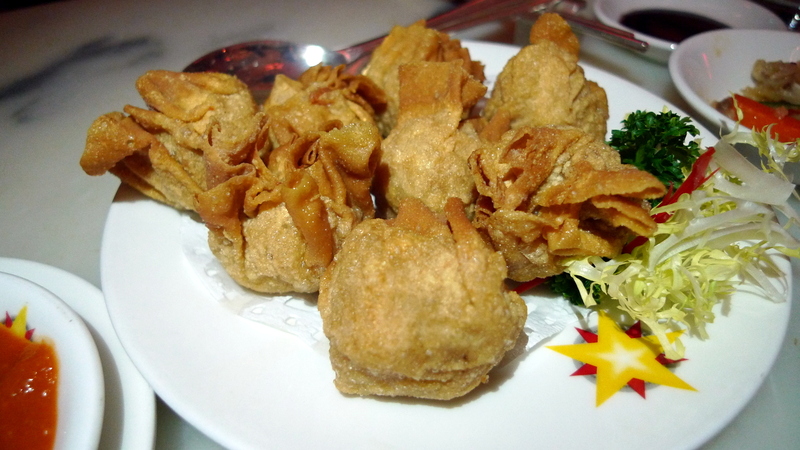 The menu is mostly Chinese, with an emphasis on Cantonese cuisine, the style indigenous to Hong Kong. We did order a few variations, though. Appetizers began with these deep fried prawns with foie gras, wrapped in tofu sheets, which featured large, fresh prawn meat. 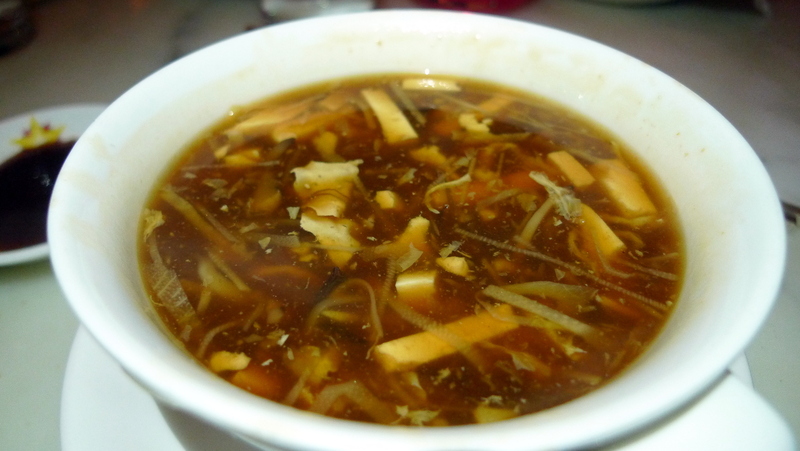 Soups are usually available per-person, that way everyone can order what they want. 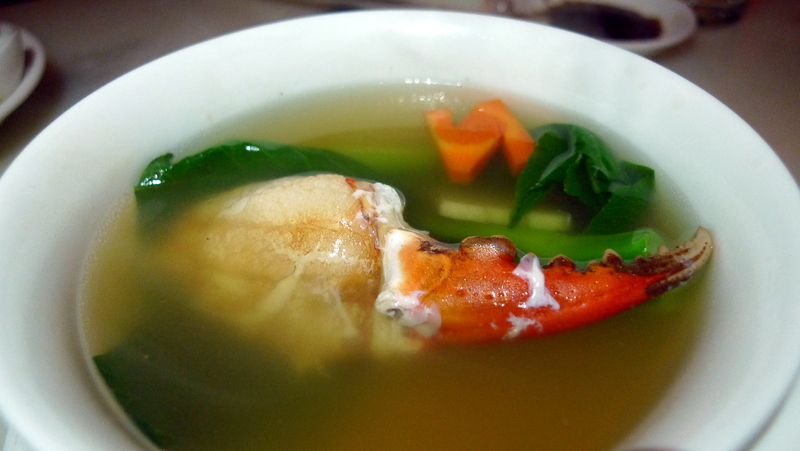 One of our friends had this crab claw meat (one perfect, unbroken piece) served in a lovely consommé broth with vegetables. 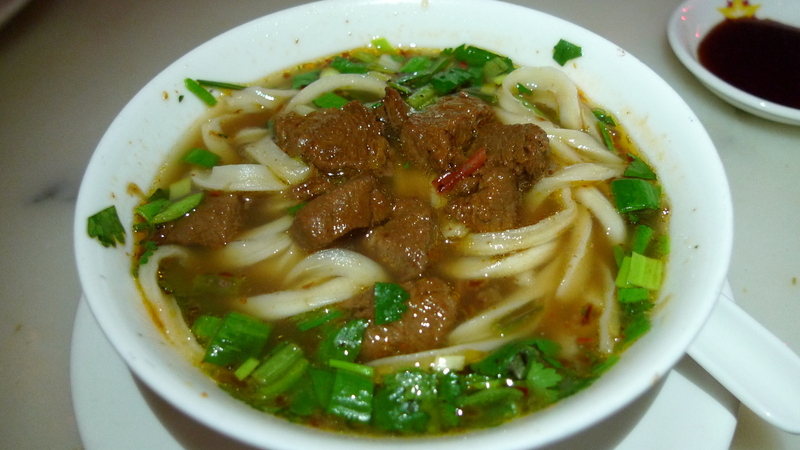 I tried one of the special soups, which was braised beef brisket in hand-pulled noodles. The brisket was nicely tender and flavorful while the noodles had a pleasant “al dente” texture. 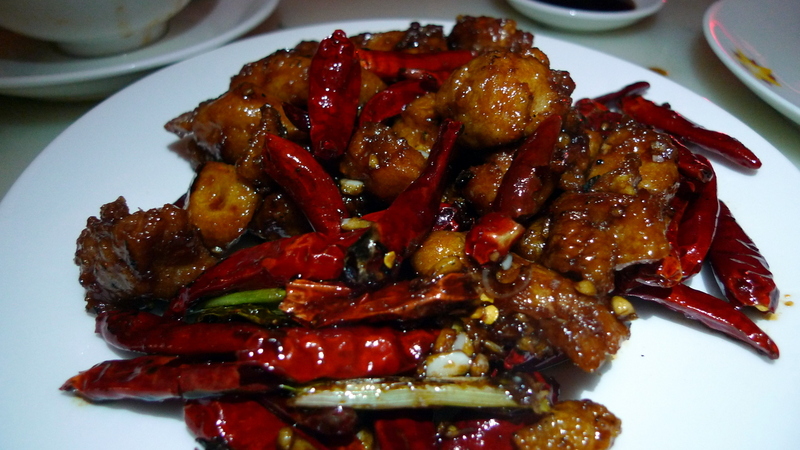 This is a Szechuan style dish: sautéed diced chicken with garlic, star anise, chilies, and spring onion. It isn’t as hot as you might imagine and was one of my favorite dishes. For variety, I ordered another Szechuan dish: dan dan noodles. 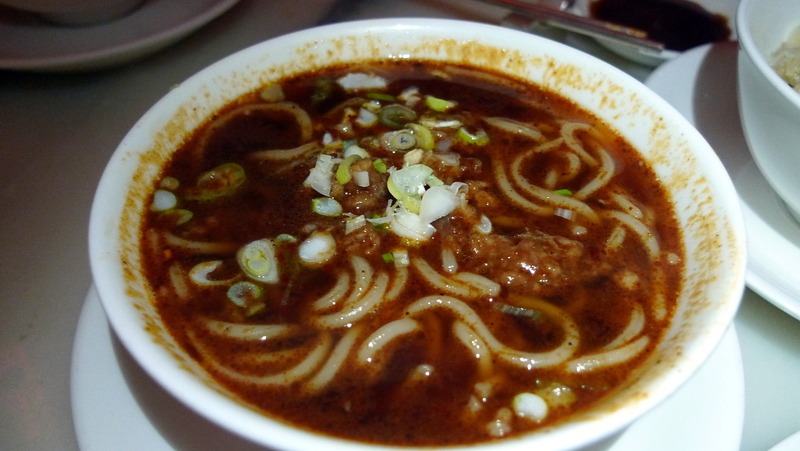 This dish has a spicy chili sauce made with preserved vegetables and minced pork served over noodles. This particular version had a lot more sauce than usual and the sauce had less of the tongue-numbing Szechuan peppercorns than I have experienced in other versions. Nonetheless, it was enjoyable. 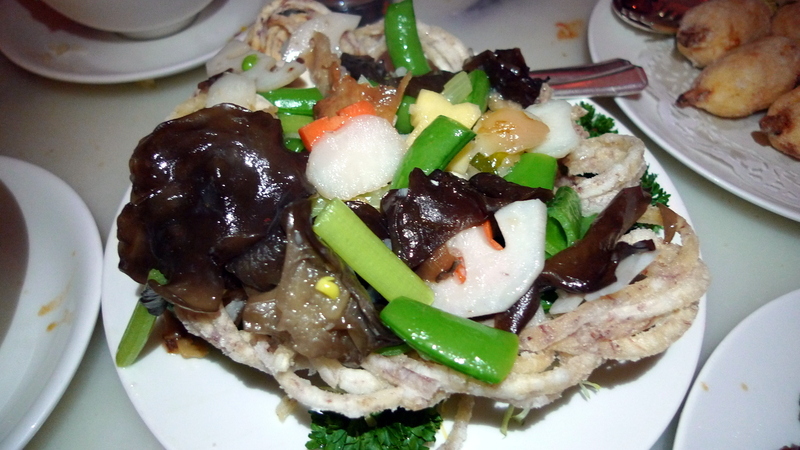 Sautéed lotus root, sweet peas, water chestnuts, and various fungi served in a nest made from deep fried taro root. 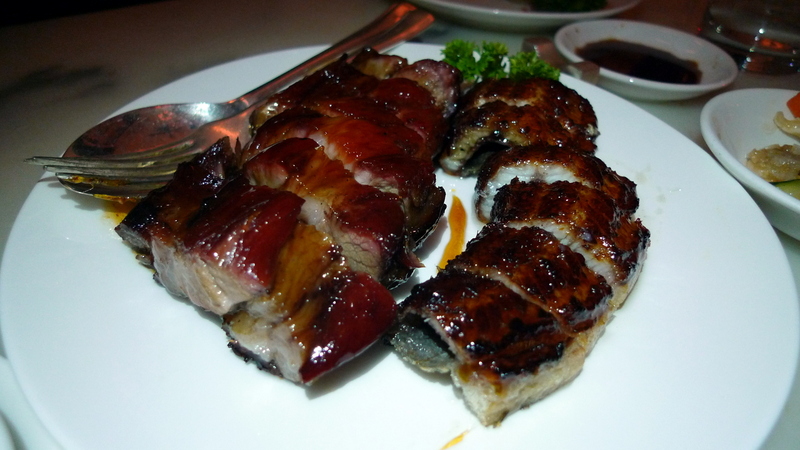 This was a wonderful example of the clean flavors, simple preparation, and elegant presentation of Cantonese cuisine. Of course, it can also be heavy and oily when poorly done. I ordered this dish as an appetizer and it arrived near the end of the meal. 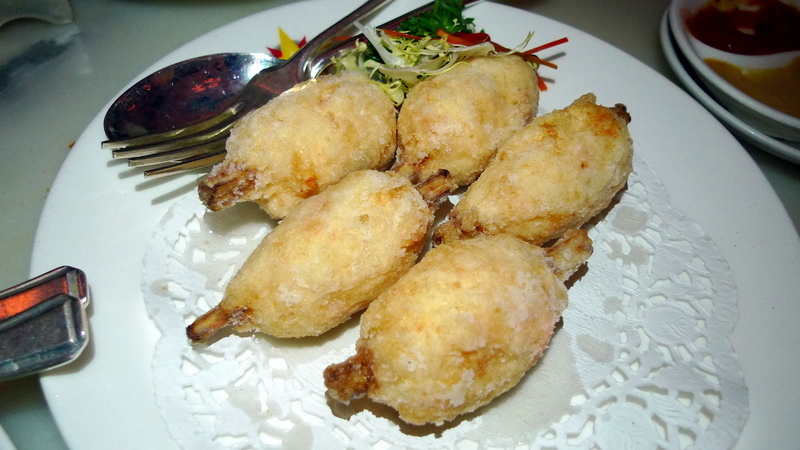 Familiar to people who dine at Vietnamese restaurants, it is chopped shrimp made into a paste, formed around sugar cane, and deep fried. Always tasty. 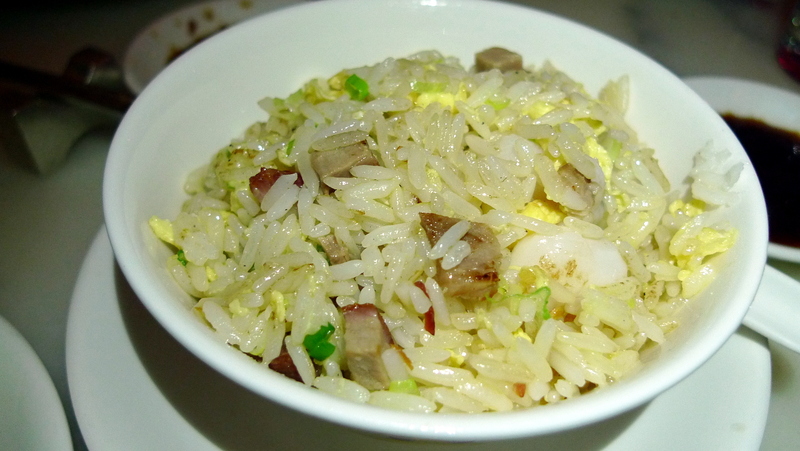 We concluded the meal with some fried rice, this one a mixture of different meats and vegetables. As with most Chinese banquets (although this meal was ordered a la carte), the rice is served last so that you do not fill up on it during the meal. 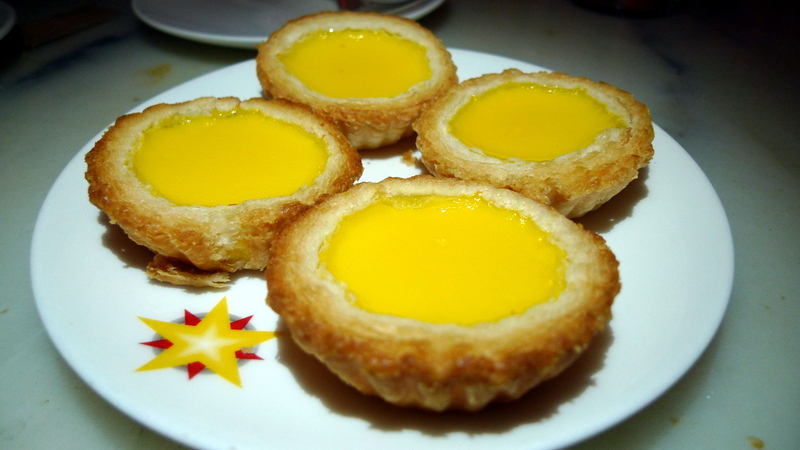 For dessert, we shared a few items that didn’t photograph well plus these lovely egg custard tarts. With a very flakey and not-too-oily crust, the tarts were a nice conclusion to the meal. We also inexplicably received fortune cookies. I say “inexplicably” because these are an American invention and not authentic in the least. 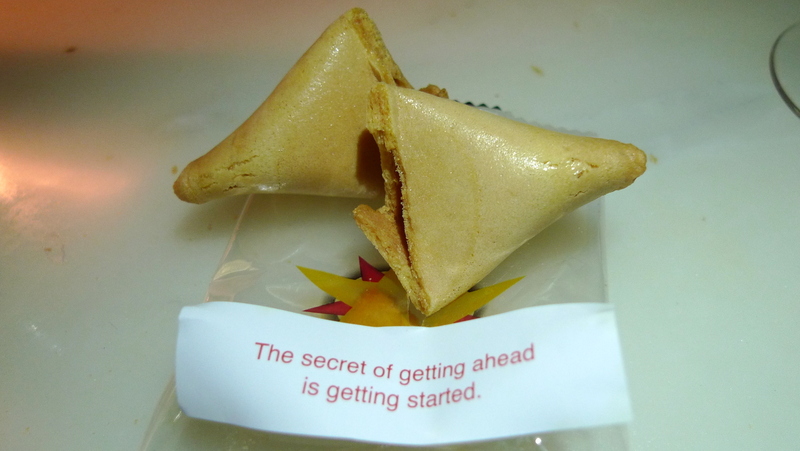 To top it off, there seems to be a trend of fortune cookies increasingly reading like “advice” cookies. As one Chinese friend pointed out, the quality of writing must be suffering because the fortunes are now outsourced to a factory in China. Ha! 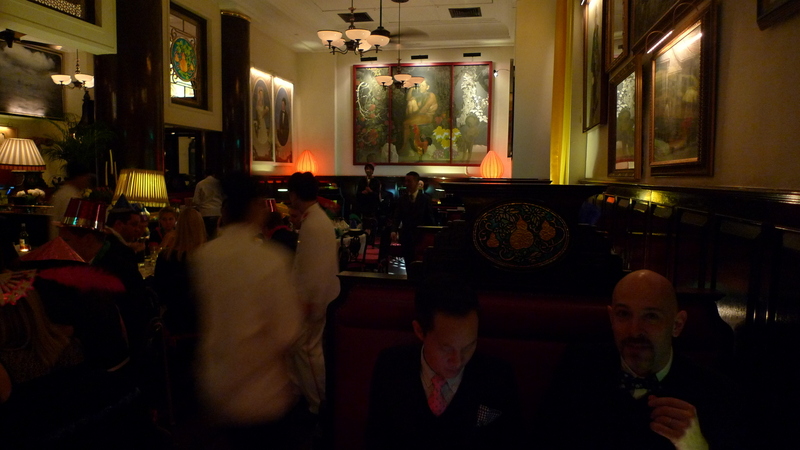 All in all, China Club was a good meal and a fun place to dine on New Year’s Eve. For more info, here’s their website. Note that the club is members-only so to go, a member needs to make reservations for you. This entry was posted in Food, Travel and tagged Cantonese, China Club, cuisine, Dining, food, hong kong, New Year's Eve, travel by christao408. Bookmark the permalink. Well, you have fountain pens, which are equally archaic. No, that’s not what I meant … I never had or wore bow ties. 🙂 I own a few ties though but never wear them. Wow – what a dinner. I had no idea you guys had connections in HKG. For some reason, I don’t look good in a bowtie. Everybody looks good in a bowtie! Oh my god, adopt me please. That food. All of my want. Very nicely dressed and what a way to ring in the new year. I laughed out loud at your new years resolution to tie a bow tie – because that’s a fun resolution and because I still use YouTube to tie a tie! Thankfully, I learned the double windsor when quite young since I had to wear a tie to church every Sunday. The bow tie, though – that’s a whole different beast. I’ve had the desired effect! This looks absolutely wonderful and what a wonderful way to say goodbye to the old year. Wishing you and Tawn many wonderful meals and times together through out 2014. Thank you very much. Wishing you all the best, too! Nice meal and fashion! You did a perfect job on the bow tie indeed! Great couple (you and Tawn) photo you presented in FB too! Happy 2014! “awkward” is the right word! Eye-popping closeups. Congratulations on your new(?) camera. Nope, same camera as always… better lighting, though!